LOWNDES COUNTY, AL (WSFA) - "I could smell it myself late in the afternoon," said Lowndes County resident Willie Spivey. For more than 30 years, Spivey used a single white pipe to flush out sewage behind her home in the woods. "Yea, I could smell it late in the afternoon," she said again. This year, however, that changed when the Alabama On-site Wastewater Association installed a free underground septic tank behind Spivey's home. But not everyone is as fortunate. About 40 miles away in Farmersville, Bonnie Bryant's family installed an illegal septic tank in the front yard and it doesn't work. "No matter how deep you put it in, it has a way of coming up," Bryant lamented. U.S. Rep. Terri Sewell's goal while touring the area was to see the problem first hand. Later they gathered at the Interpretive Center on Highway 80 to talk about a plan of action. 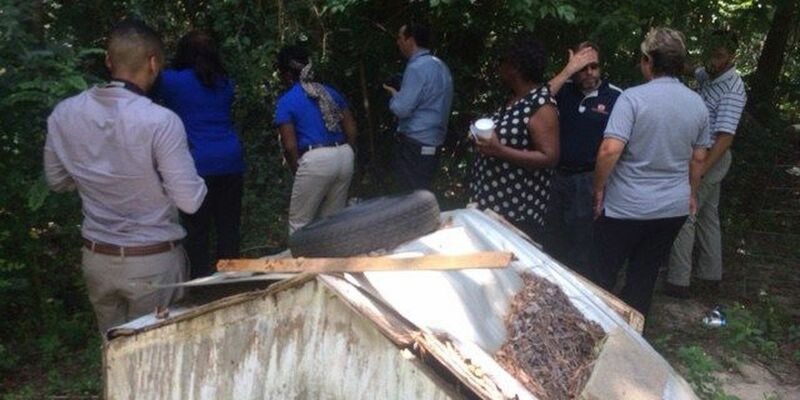 Part of that plan is to encourage residents to self-report their methods of getting rid of waste with no fear of being written up such as Bonnie Bryant, who is technically violating health standards. "One of the things I proposed today is that we allow a pilot program for Lowndes County, the public health department issue a moratorium that we're not gonna fine people, that we allow easy self-identification when there are failed systems, households can identify without fear of getting fined or getting in trouble," Sewell said. "Because we have to identify the scope of the problem before we can come up with a dollar figure on how much it would cost to actually solve it." "She did call us out," said Sherry Bradley of the Alabama Department of Public Health. "She wants help and we're here to help any way we can." The problem in Lowndes County is that some parts of the soil aren't conducive to sept tanks. "It's really a clay soil, a very thick clay soil that does not allow water to permeate down into the ground," explained Dr. Kevin White, Professor and Chair for the Department of Civil, Coastal and Environmental Engineering at the University of South Alabama. "We have to be able to identify the scope of the problem before we can actually come up with a dollar figure of a cost to actually solve it," Rep. Sewell said. It's unclear just how many people in the Black Belt are piping out their sewage. Spivey's been there, done that. No more. Sewell says 20 percent of American households are not connected to a wastewater system.